India’s Economy is growing rapidly. There is massive migration of people from rural to urban areas. Cities are expanding in all directions. Local government is pressurized to expand and increase the physical infrastructure to accommodate the increasing population. Government of India has initiated an ambitious Smart Cities programme to make cities livable. This programme tries to solve the problem of rapid urbanization. It includes developing new cities and modernizing existing cities. The focus is on improving core infrastructure services like water supply, sanitation, solid waste management, transportation, affordable housing, power supply and robust IT connectivity. The Smart city should enable citizen’s participation and provide good governance. Building infrastructure needs domain expertise and huge capital expenditure. Local government bodies have to ensure that all these facilities are optimally used by citizens. The Smart City programme is focussed on citizens. Main target of Smart City is to develop a ‘single point of contact’ for citizens that deliver services and information to citizens. Smart City partners (Private and government agencies) are working with Local government to build these capabilities. Public services need to adapt to the needs of citizens. Mobile services are the future. Citizens need live information while being on the move. The wide use of mobile phones and Wi-Fi networks allows the local government to deliver services to its citizens. To provide relevant and appropriate service, a wide range of geographical, demographic survey data has to be analysed to better understand citizen’s needs. This is important to customize and re engineer the services offered. It would allow partners to identify and use the most appropriate service channels for different target groups such as senior citizens, workers, children, youth and women. Identifying and analyzing the needs of citizens will allow partners to proactively provide services that will meet their needs. This will ensure that services are designed and implemented in ways that recognize the specific needs of different groups of citizens. Smart Cities’ partners are developing a range of new and innovative services which can be delivered via mobile platforms using robust IT infrastructure. Huge amount of static and streaming data has to be analysed on need basis to take decision. These partners need to use a strong mix of knowledge and establish best practices to do a better customer profiling and to identify the most appropriate channel choices for service delivery. Each city will have its own set of geographical, transactional and demographic survey data. Local Government has to offer solution to its citizens. Each smart city will require storage, networking, and computing and analytics application to process the data and provide its solutions. At the same time, cities will be interconnected to share the information with each other. 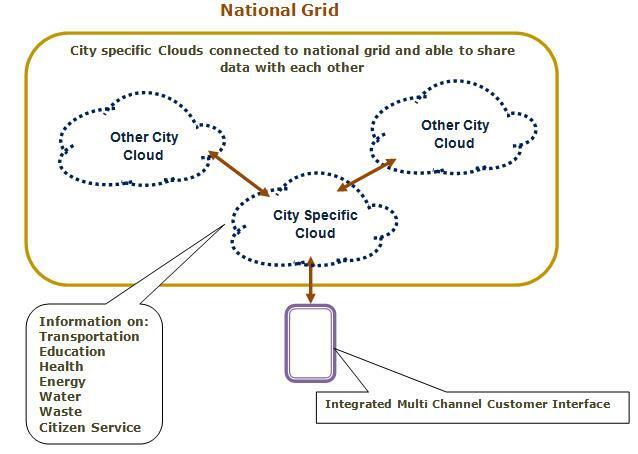 All cities will be connected with the national grid. This can be viewed as shown below. To provide such effective solutions, government has to leverage a wide range of ICT solutions. Cloud technology can fulfill the unique requirement of smart cities programme. 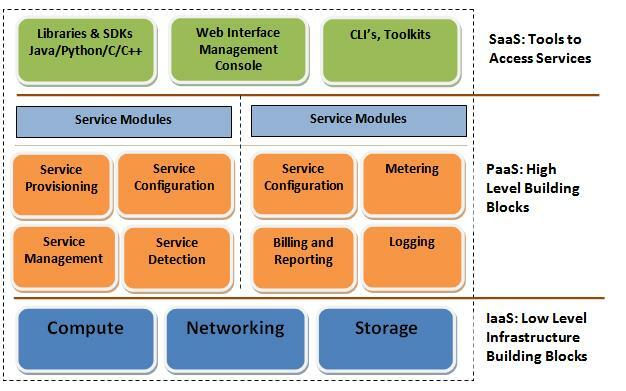 Cloud technology platform is a vast and complex ecosystem. It includes components such as Networking, Storage, Computing, analytics and Security solutions. Cloud Architecture is a layered architecture where multiple layers of software, middleware and application work as a single entity. There are multiple cloud technologies from competing technology solutions providers. Some are proprietary technology while others are from Open Source community. Integrating technology component from such wide range of solutions requires expertise. Calsoft brings niche expertise in Cloud ecosystem. Calsoft’s service offerings will enable Local Government and Smart City partners to quickly develop next generation cloud solutions which can cater to their specific needs. We can develop custom applications utilizing proprietary and Open source Cloud technology. Senior Technical Leader at Calsoft Inc.